If you follow me on Instagram, you know that I’m obsessed with buffalo wings and that I can sweet talk any good restaurant into giving me their buffalo wings un-breaded. Before going keto, I used to order buffalo wings at every restaurant I went to. Now I’m lucky if half the time they’re not breaded and that the other half of the time, they aren’t coming from the freezer pre-breaded. 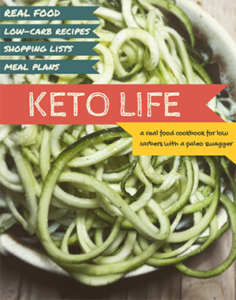 So I’ve taken it upon myself to perfect a keto buffalo wing recipe! I think it’s pretty perfect, but I’ll let you be the judge and let me know what you think. The wonderful thing about buffalo wings is that chicken is carb-free and usually, so is buffalo sauce. Win-win! Preheat oven to 400 degrees F. Using a wire rack, with a baking dish or sheet underneath, spread wings evenly. The wire rack will keep them from getting soggy on the bottom. Rub with your oil of choice(maybe not coconut because the flavors will compete, but I believe I’ve used olive oil, ghee, avocado oil, and they all work the same. ), and then sprinkle generously salt and pepper. Bake for about 45 minutes or until crispy and at least 165 degrees F.
While your chicken wings are baking (or frying, cook whichever way you prefer), add your garlic and butter to a small saucepan over medium-low heat until hot and melted. Once melted, add the rest of the ingredients and mix together. 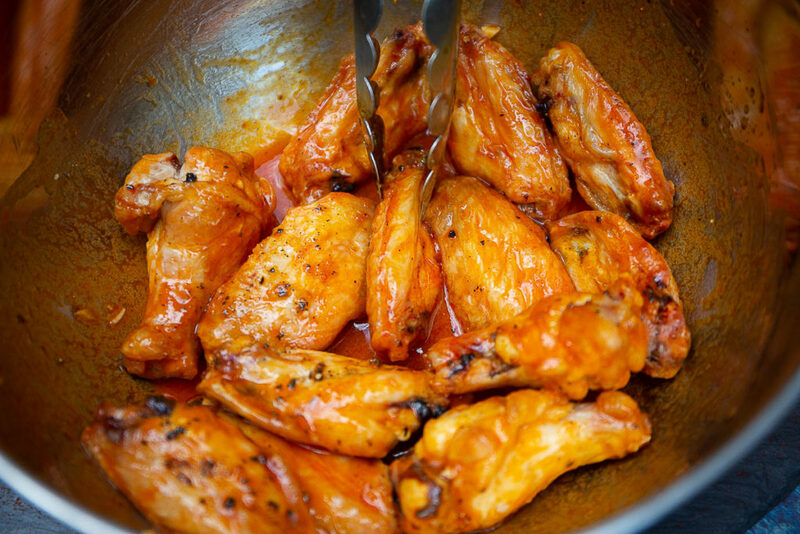 When your wings are cooked, toss them in a bowl with sauce, until coated. 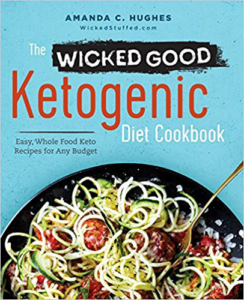 Serve your keto buffalo wings alone, or with salad and celery, or coated with blue cheese crumbles and enjoy! 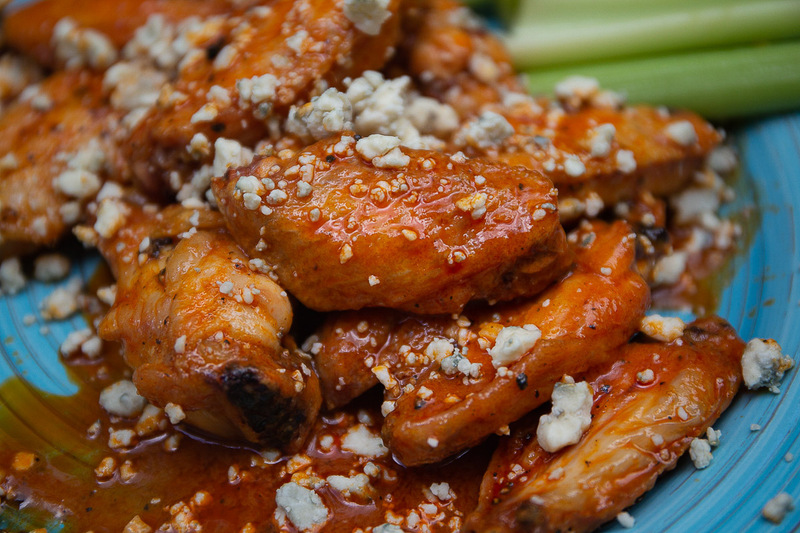 The wonderful thing about buffalo wings is that chicken is carb-free and usually, so is buffalo sauce. Win-win! Wings are a great party snack, but so is pizza. Be sure to try my Rhode Island Fried Pizza recipe and let me know what you think. These look delicious as btw! ScottCRM The information is dependent on your brand of hot sauce, otherwise it’s zero to 1 carb for the garlic. Thank you for the nutritional info. I’ve been craving “wings”! ReganGillespie Sorry to hear that! This is a photo right after I made it with this recipe. How did it turn out using an air fryer? We made these the other day and they were the bomb! I baked them on a cookie sheet with parchment paper, so it didn’t stick, with garlic salt on them. Then brushed on the Buffalo mixture and broiled them for 5-7 min each side until they were browned. Perfect! Thanks for the recipe! How long do you bake them and on what temperature. Sorry…I’m a total newbie but my husband LOVES wings! I do mine on the hob for the full 30 mins the wings are in the oven and it reduces into a really nice thick sauce. I don’t have access to the sauce in the recipe though so maybe mine is different. I made just the sauce tonight for some home grown pastured pork meatballs. Awesome stuff thanks. The best is I made double the recipe for other yummy stuff! (maybe wings) LOL THANKS! What is the best oil for KETO fried wings? This recipe looks delicious. Can it be ahead of time and reheated? Thanks for replying. I guess I’ll finish them just before serving. I tried this with Frank’s Hickory Hot Sauce…….awesome! Four wings!! Surely you jest! I can go through 10 wings in a sitting without ever thinking about it. Obviously, they had better be extremely low carb! PS I have lost 30 lb in the past 4 months on Keto, just in case you think I’m eating too many calories! Do you cook these from frozen? These came out GREAT! Nice and crispy, with a perfect wing sauce. Served with a good chunky blue cheese dressing on the side. The wings I found in the store were terrible, so I bought thighs instead. They also worked perfectly. Nice and crispy. Do you know how long the sauce would keep if we just made that and kept it in the fridge? I think this would be delicious on shrimp as well. Any good restaurant wouldn’t bread their “Buffalo” wings to begin with. I’m from Buffalo, and you can’t find a breaded wing at all. If I give this new lifestyle a legit shot, I know I’ll always have the wing option when out at almost any restaurant here. This is exactly how I make mine! It just doesn’t get any better, except for those blue cheese crumbles though! OMGosh! It has me drooling! That looks ah-mazing! Is WickedStuffed your name on insta too? I’d like to give you a follow! Yes it is! So glad you liked it! We have been using the original WickedStuffed BW recipe and love them. 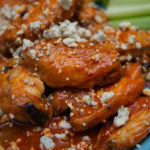 Will try baking on a rack tonight and try the crumbled blue cheese on top of cooked wings…love that blue cheese!! Did I miss the air fryer instructions? I just made these. Thought they came out great just a bit salty. I think the next time I will omit the salt…but very happy with the flavor. I’m a wee bit confused at step 1. Do you bake at the 400 degrees? What is the 165 degrees at the end? Could you explain the 2 temperatures? Hanna, I believe the 165 is the temperature of the wings if you were to use a meat thermometer. Just made this, loved it, a real keeper. Had it with German cuke, mater,onion, sour cream, dill salad and lemon, ginger and strawberry carbonated water. Fantastic and satisfying lunch! Used sour cream and parmasen for dipping. I use my air fryer instead and will coat the wings before cooking them then add a little more after they are cooked. I also use Franks!